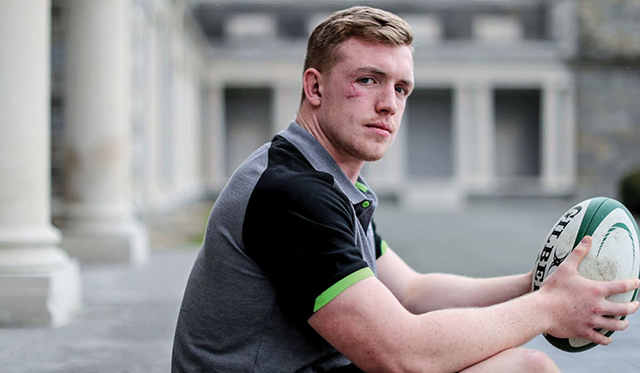 Rugby player Dan Leavy has been appointed as the new celebrity ambassador to CMRF Crumlin. The 24 year old Dublin man, who plays for both Irish and Leinster senior rugby teams, said he was impressed with the work done by the Children’s Medical and Research Foundation, as the principal fundraising body for Our Lady’s Children’s Hospital and the National Children’s Research Centre (NCRC). “The staff at CMRF Crumlin are amazing with all the fundraising they do for these children and their families, and the doctors, nurses and play specialists all make the experience as nice as possible for the sick kids,” he said. In a statement released by CMRF Crumlin, Head of Communications Fiona O’Malley said she was “delighted” to welcome Leavy as the latest ambassador for the charity. “He’s a real-life hero for so many of the children in the hospital and it’s great seeing their faces light up when he visits with his colleagues. “We’re looking forward to working with Dan on future campaigns with CMRF Crumlin and continuing the great work he’s already done,” she said. The announcement came two months after the appointment of former Cork camogie player Anna Geary as the latest celebrity ambassador in November. Leavy joins Leinster teammates Rob Kearney and Johnny Sexton, as well as footballer Robbie Keane and television presenters Ryan Tubridy, Karen Koster and Baz Ashmawy as celebrity ambassadors for the foundation, which was set up in 1965. Celebrity ambassadors are vital to the work of charities, such as CMRF Crumlin, in order to raise awareness and support for their research and fundraising efforts. CMRF Crumlin raised €11.5 million through fundraising alone from February 2017 to March 2018. On average, 150,000 children will visit Our Lady’s Children’s Hospital Crumlin every year, with an average of 185 children staying in the hospital per night.